If you’ve been looking at cars on the internet for more than five seconds, you’ve probably seen Matt Farah’s “One-Take” series on his YouTube channel The Smoking Tire. If you haven’t seen the real One-Takes, well, this Car Bros parody probably won’t be that funny. But basically, owners of interesting cars bring their wheels out to LA where Farah takes them for a quick drive, talks about the vehicle and gives his driving impressions. The cinematography is super simplistic (hence “one take”) but the selection of cars is diverse which usually makes for some interesting watching. Farah’s a friend of Jalopnik and said he “hadn’t seen this” when I asked him about it, but he’s got a good sense of humor so I’ll go ahead and assume he’d take the mockery as a complement. 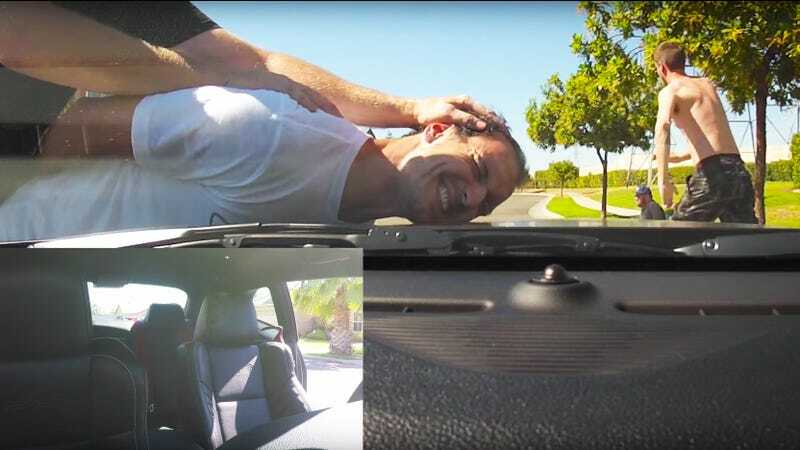 Car Bros has produced a mere 12 YouTube videos to date, which all parody a different internet-car-video-trope and are pretty much all hilarious. I can only dream of one day being cool enough to be lampooned by these dorks.